Did you know Green Tech Carpet and Tile Cleaning also offers professional upholstery furniture cleaning in your New Port Richey, FL home or office? Just like the flooring and carpet, your upholstery will look better and last longer with our professional furniture cleaning services. Our cleaning methods combined with our special equipment carefully restores your furniture to a clean and fresh condition. Enjoy the look and fell of your upholstered furniture again with a deep hot water extraction cleaning. 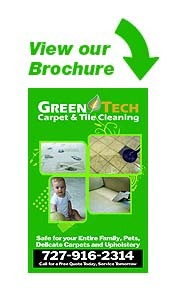 We use only green, eco-friendly solutions that are safe for you, your family and pets. Ross, the owner-operator of Green Tech will inspect the furniture, noting fabric type and soiling conditions. He will also advise you of any possible permanent staining. Your upholstery will be vacuumed if needed. Your carpets or hard surface floors will be protected with an absorbent material to ensure we do not drip or over spray as we clean the upholstery. The fabric is “pre-treated” with special green, non-toxic cleaning solutions specially designed for your particular fabric and soil condition. This loosens up the soil to make the extraction more effective. 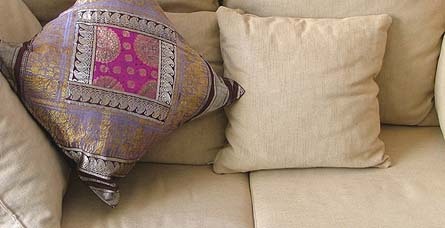 Some areas of your furniture may be more heavily soiled on arms rests and cushions. The pre-spray will be worked into the fabric with a horsehair brush, or even a mechanical device specially designed for this use. Once the soil has been loosened and brought to the surface of the fibers, we will thoroughly flush the fabric with our specially designed upholstery extraction tools. This removes soil from the fabric and leaves your fabric soft and free of any soil attracting residue. If there are any spots remaining after the cleaning process, special spotting treatment is used. We can remove most spots, but there are some stains that can only be lightened. Special high volume air movers are used to speed drying of the upholstery during after the process. Apply a solvent based protector to repel oily soils and drink spills. This will keep your upholstery furniture cleaner longer in your New Port Richey, FL home. There is an additional service charge for fabric protection and is solely up the the discretion of the customer. If the fabric has a nap, the nap is re-set in one using a fabric grooming brush. Green Tech provides these furniture and upholstery cleaning services to keep your New Port Richey, Fl home looking it best, in addition to carpet and tile cleaning. We also clean microfiber in addition to many other fabrics.